When this card is Normal Summoned, you can: Special Summon 1 “Shiranui Spectralsword” monster from your hand or Deck, also you cannot Special Summon monsters for the rest of this turn, except Zombie monsters. If this card is banished: You can draw 1 card, then discard 1 card. 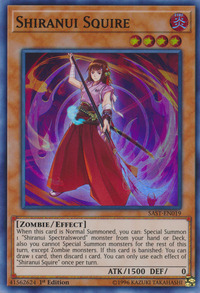 You can only use each effect of “Shiranui Squire” once per turn. This monster appears in the artworks of Ghost Meets Girl - A Shiranui's Story, Shiranui Style Solemnity, and Shiranui Squiresaga. This monster (as well as its other evolved forms) wears a hair ornament which is similar to that of Dakki, the Graceful Mayakashi.